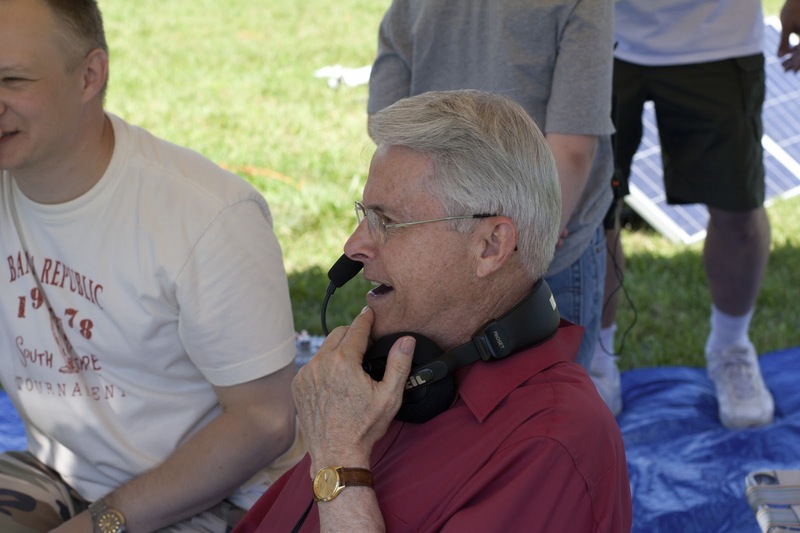 The first one was when Virginia State Senator Black visited the Field Day station. We actually had two elected officials visit the station, but Senator Black stayed for an hour or so, and checked out every thing there was to see, including the Satellite Station, GOTA, etc. He asked a lot of questions, especially about the benefits of Amateur Radio in emergency situations. He was definitely interested. The best moment, however, came when we sat him down on the GOTA station. He kept repeating the GOTA call sign, then complaining that it was too long, mentioning how his call sign as a fighter pilot was much shorter. Well, he finally made contact, then the person on the other end asked if there was a child after repeating the GOTA station. He replied back that there was a state senator who wanted to make the contact, and the person on the other end agreed to talk. He repeated the call sign again, and got a bit frustrated, when he reverted to his previous communication skills as a pilot during Vietnam. Basically, he gave a simulated bombing call over the air on Field Day. We were all cracking up, it was awesome! I would love to know what the reaction was on the other end, but I'll never forget it! The next memorable moment came when I first sat at the operator's chair, running VHF. I made several contacts, but switched over to 2m FM on a hunch. Well, I managed to make one contact, K4NVA, club call of the Sterling Park Amateur Radio Club (SPARC), rivals of the Loudoun Amateru Radio Group (LARG), where I was operating from. Being a slow day on VHF, we had a bit of a conversation, which ended up being a much needed stress relief. When I left at 2 a.m., it remained the only FM contact logged. Another fun time came the first time a kid used the GOTA station. He logged a contact with Spain, the only DX from the GOTA station the entire time. In fact, it was the only DX I heard the entire day! 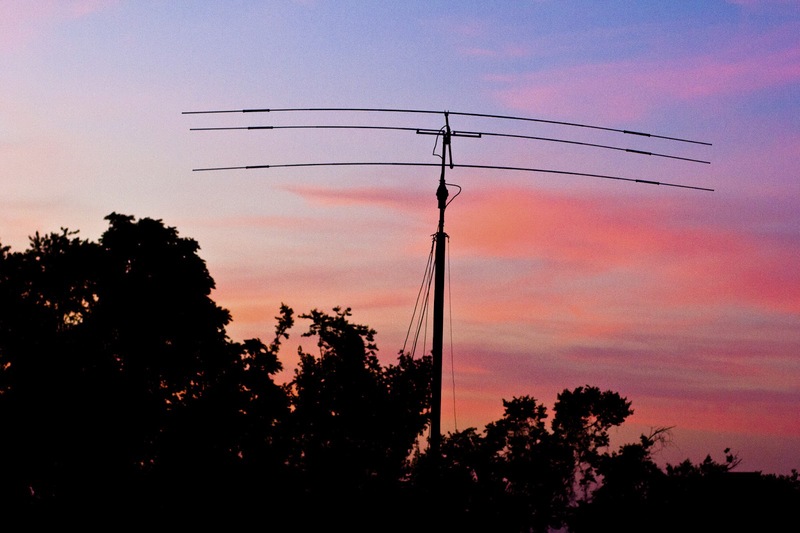 Tri Band (10, 15, 20) set up just as the sun set on Thursday. I should say that setting up antennas was quite an experience in and of itself. I had a lot of fun just learning from everything, even though I wasn't able to participate as much as I would have liked. Next was running second seat for 20m SSB. I saw a truly superb operator make 100 contacts in an hour's time, while I was sitting there trying to copy everything he heard, and get it in the computer. I think I managed to make it happen, but it was an exciting time, for sure. I learned a few tricks though, which I would later use. Another fun moment was when I was sitting second seat, and a bit of morse code was heard on the SSB portion of the band, and the person sitting next to me called him back, not even realizing that it wasn't voice. I was kind of amazed with that one. Lastly, was my turn on GOTA. I've decided that I qualified to use the GOTA station, but only barely. Well, I took what I had previously learned, and set up shop. I probably made 30 contacts or more in less than hour's time, which was far better than anyone else who sat at the GOTA station had done all day long. I just found a rhythm, and stuck with it. Bottom line, Field Day was a lot of fun, and I'm bound to have memories from Field Day for some time to come. It should be a lot of fun for next year! I can't wait to see how we ended up doing!